The Human Hair English mustache begins at the middle of the upper lip and then thins out and curls up to the sides at the corner of the mouth. 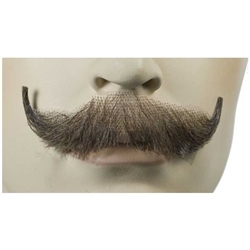 The English mustache is a smaller variant of the handlebar mustache and is perfect for aristocratic character. Please note that this item requires spirit gum to apply. extremely realistic and superb for stage, video, film and closeup work. We recommend our spirit gum and remover combo pack.